Tag Archives for " Krista Bunskoek "
It’s guest post day here at Duct Tape Marketing and today’s guest post is from Krista Bunskoek – Enjoy! Think email marketing is dead? Think again. Last year alone, 44% of email recipients actually admitted to making a purchase based on promotional email they received. 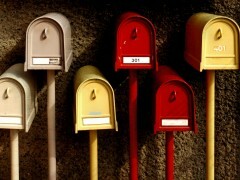 Email is one of the most personal, customizable forms of online marketing. And it works. As smart marketers and small business owners, we’re always looking for better ways to build our email lists with qualified leads. Retail consumers love to get a great deal. Set-up email-gated coupons through your website to generate qualified leads (and get immediate sales too.) By giving away coupons related directly to your products, you’ll only attract prospects who are interested in your particular wares. I like to win, you like to win – your customers like to win too. Host an email-gated contest directly on your website. Use sweepstakes to both promote your business (by giving away a business related prize) and generate leads. Use contests like photo contests, photo caption contests and vote contests to make your website more engaging. 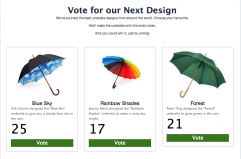 You win by getting user-generated content, consumer input – and emails. Do you have a PDF catalogue of your products? Upload it to your website. Set up a simple lead generation landing page to enable interested buyers to download it for free (in exchange for an email and name) whenever they want. These days you’re likely blogging. If you’re blogging the right way, you’ve got a series of informative or interesting articles related to your business. Take 5-10 well written articles and turn them into a valuable resource for your market. 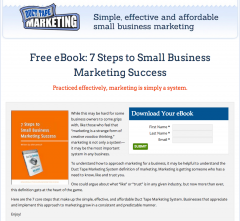 Give the ebook away for free through an email-gated landing page. Let your prospective customer test out your goods. Give away a free trial for a limited time period – all for the mere cost of an email. A free trial attracts warm leads who are just ripe to nurture into new buyers. Use the emails to send out timely, personal messages to reel them in. If you offer customized pricing, get email leads by setting up a distinct “free quote” landing page. Make it easy for your website visitors to take their interest in you to the next level. Set up an email-gated form on your site to catch those leads, warm them with your charm (and price) and get the sale. If you’ve got a slick sales team (even if that’s just you), a live one-on-one consultation can close the deal. It can also give you very warm emails to keep the relationship going. A lead gen consultation page is a must for your business. Live, free webinars give you the chance to connect and engage with genuinely interested customers. Webinars show your customers that you’re willing to share your expertise for free – and that you know what you’re talking about. They take a bit of prep time and you have to make a new webinar for each lead gen opportunity. Maximize your lead generation by recording a series of email-gated webinars. Want to educate your market and be seen as the helpful knowledgeable business leader? Write a number of free how-to guides related to your product or service. Give them away for free on your website through an email-gated landing page. If you’re starting a new business or product offering, a key tactic I’ve successfully used is the “launching soon” landing page. Generate emails by marketing your products and giving pre-signups sneak peeks, special deals and engagement opportunities (such as product name contests, logo vote contests or ebook cover contests). Send out emails to keep the relationship – and excitement – building. Building your email list is the foundation to business success. Try out one or ten of these tactics for your website. Let me know how you do. Got more email lead generation tips? Krista Bunskoek is a Content Marketer at Wishpond. Wishpond makes simple tools for epic online marketing campaigns. She’s written a number of online marketing ebooks like Google AdWords for Small Business and Website Contests and Promotions. You can reach Krista through her twitter handle @kbunskoek or her Google+ page.